Mobile app development has taken huge leaps. Today where there is an app for almost everything – from news and entertainment to education and shopping, is your business accessible through a mobile app? 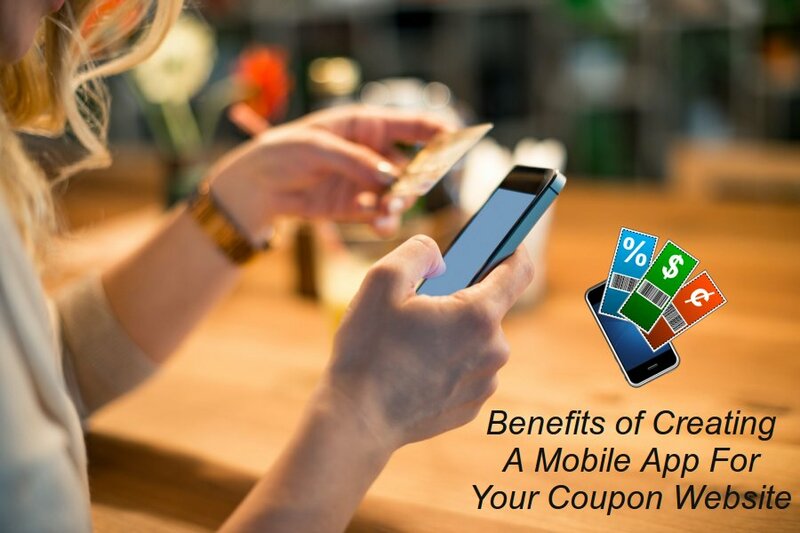 Below are the Top 6 Reasons Why Your Coupon Website Needs a Mobile Application for smartphones and tablets. Mobile apps are not just apps today – they are solutions to every business problem. They have evolved as a tool that efficiently supports marketing strategies of a business. A mobile app bridges the gap between your customers and your business, enabling you to communicate and interact with them via a direct marketing channel. A mobile app also helps you target mobile users especially if you are into coupon providing business where staying in touch with your customers is of utmost importance. In today's post, we are discussing the benefits of having a mobile for your coupon website to help you understand whether you need a mobile app or not. Geo-targeting is a vital part of internet marketing and geomarketing that helps in determining the geolocation of your traffic and delivering the most suitable content according to a particular criterion such as IP address, postcode/metro code, city, region/state, and country. According to Johan Den Haan, CTO of Mendix, mobile apps are the easiest ways to target key users with time-sensitive and location-specific messages. As an instance, when you incorporate geolocation into your mobile app, you can send special discounts to customers who are near your store. Moreover, using SMS texts with geofencing enables you to connect instantly with your customers who are in close proximity to your business. “Organize a sale for your loyal customers and send them an SMS text written specially to introduce the sale organized just for them, a flash sale or a special event when they are so near to your store. This makes them feel special and captures their attention, and of course, by making the most of scarcity and exclusivity, they will most likely to stop by to at least check out the sale organized,” says market research analyst & copywriter, Ashley Orndorff. In today's highly competitive market, it is difficult to capture the attention of your target audience. However, with mobile apps, you can treat your audience with a customized experience and improve user experience drastically. Personalization helps you make tailored communication with your users according to their usage behavior, location, interests and more. You can allow your audience to set up their preferences immediately after downloading the app, based on which you can serve your users with the right content. Moreover, the mobile app can even be used to monitor user engagement, and provide custom updates and recommendations to the audience. Mobile applications can be built to use inbuilt features of a mobile device such as a compass, accelerometer, phone calls, GPS, contact list, camera and more. This way you can make the user experience fun and interactive. Furthermore, these features can minimize the efforts required on the user side. For example, when a user accesses your coupon website, you can automatically detect his/her location using the inbuilt GPS feature of the mobile phone and provide the most suitable deals and coupons. The native features of a mobile device reduce the time taken by the user to perform a particular type of chore in your app and even improve conversions. A mobile app can play an important role in building your brand awareness. As a matter of fact, users invest a significant amount of their time on their smartphones. Of course, these users come across the apps they have installed on their smartphones every day. This encounter is a great brand exercise for the apps. You can create an app that has all the features that your customers need and love. A well-designed and branded app has the potential to get customers involved with your app. And the more often your customers use your app, the more they recognize it and use it to buy your products and services. Moreover, the icon you add to your app acts as a mini advertisement for your brand which gradually influences user's perspective about a brand. Mobile apps are developed to perform a variety of functions – an app can offer news feeds, messengers, user accounts, search features, booking forms, prices, general info etc. One of the biggest advantages of having an app is that no matter what information you would like to offer to your users – including promotions and special sales – is accessible at their fingertips. They don't have a need to visit a niche specific website to get what they are looking for. You can even get closer to your customers through push notifications, and can even perform mobile app remarketing. This is basically the biggest difference between an app and a mobile website. Though apps can also need internet connectivity to perform a majority of its tasks, there are still a variety of things that can be done on apps with the internet connectivity. For an instance, your coupon app can require the internet for purchasing the coupon or deal. However, a user can easily access available deals and coupons, perform a basic search based on location or add few filters without having an access to the internet. A majority of shoppers cannot resist the temptation of huge discounts, especially when these offers are thrown their way. Using your mobile app to reach to your customers with exciting offers can persuade your target users to use your services at least once. However, make sure your app has everything that a potential customer seeks – an attractive design, easy navigation, faster loading and just necessary elements – and you are good to go. You can also hire any reputed wordpress application development company services and expertise online or offline to build your custom coupon-based website with the official support and integration of native mobile application for iOS or Android mobile operating system powered smartphones and tablets.